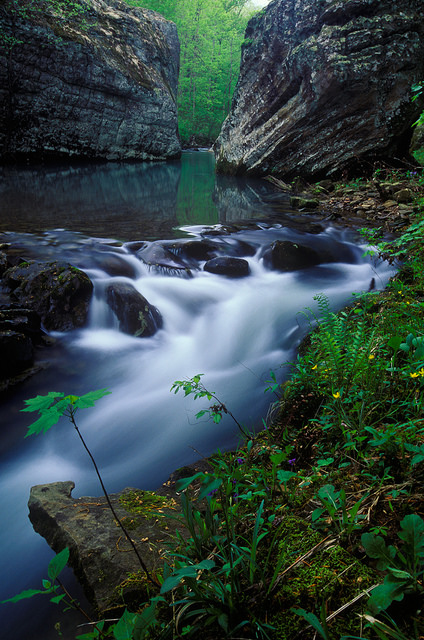 Ozark Highlands Trail in Arkansas (the section which runs along Hurricane Creek); photo by Beau Rogers on Flickr (noncommercial use permitted with attribution). The position of poet laureate of Arkansas was established in 1923. The Governor is authorized to proclaim a Poet Laureate of the State of Arkansas, which is an honorary title in recognition of outstanding accomplishments and contributions in poetry by a person who is a resident of the State of Arkansas. The poet laureate is selected from a list of names submitted to the Governor upon recommendation of a committee consisting of the principal heads of the English departments of all state-supported universities and colleges. Current Laureate: Peggy Vining (start of Term: 2003).